Rushing… | The Happy Wonderer ~ ellen b. …to get a fresh Spring post up before we hit the road home. 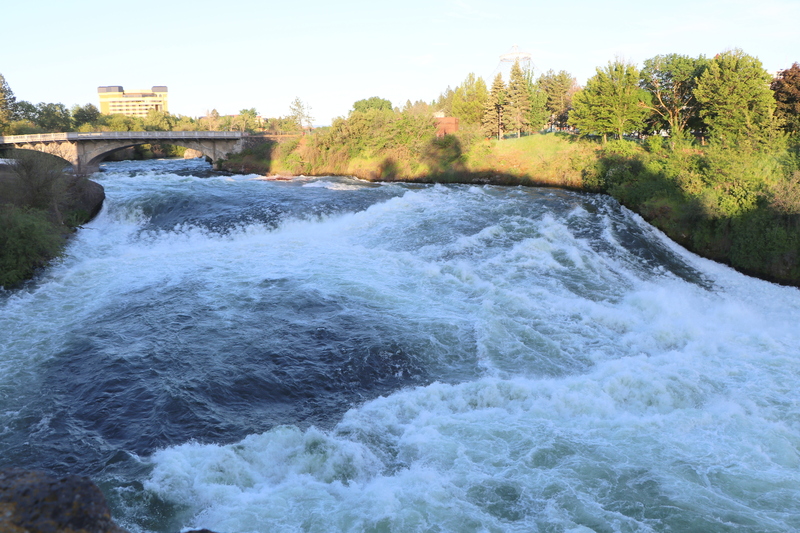 This is the Spokane River with the spring runoff rushing to the Columbia river. I’ll post more photos from our evening at the Lilac Military Appreciation Parade after I get home. We’ve had a busy time here with Addy and her parents. Until later hope all is flowing nicely in your corner of the world. Posted on May 21, 2018 by Ellen •	This entry was posted in Travel, Washington State and tagged Spokane River. Bookmark the permalink. …thanks for the cutie pie update. All is great here – we hiked today along the ‘rushing’ Middle Fork of the Flathead River, swollen with winter runoff. Beautiful, but I wouldn’t want to be in it or on it! Looking forward yo your next update! Hello, cute photo of Addy. Love the rushing waters. Enjoy your day and new week ahead. What a sweet picture of Addy. Enjoy your time with her. So much power in that rushing water. I’d hate to fall in there. Times with family are so special. Addy is one cutiepie! It seems like we should be rushing because we have only a couple of weeks before we ‘hit the road’ (which will be by air this time). But there is so much we can’t d until the last minute. Good to see the Addy update! Safe travels. Love the boots!! So glad you had more time spent with Addy! She is growing so beautifully. That river flow is amazing! Oh Addy is a true darling cherub. Enjoy!